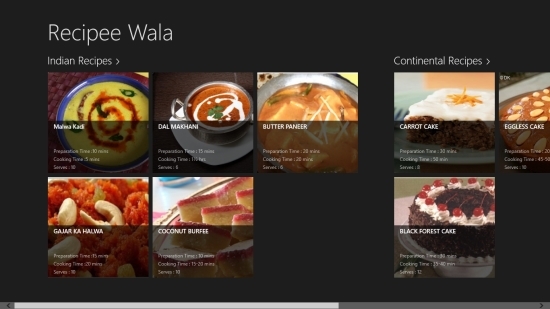 Recipe Palette is a free Windows 8 Recipe app that lets you learn some interesting Indian, Continental, Italian, and Oriental recipes. If you enjoy cooking and are enthusiastic to learn making multi-cuisine food, this app is apt for you. 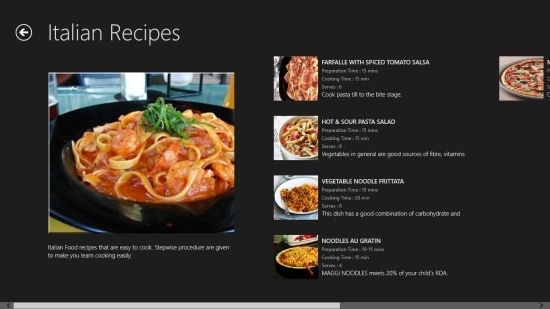 This free Windows 8 Recipe app brings to you hand-picked recipes of a variety of dishes including cakes, noodles, fried rice, pizza, burfi, etc. The detailed list of ingredients and method of preparation for each of the dishes given in the app will help you learn and make them easily at home. 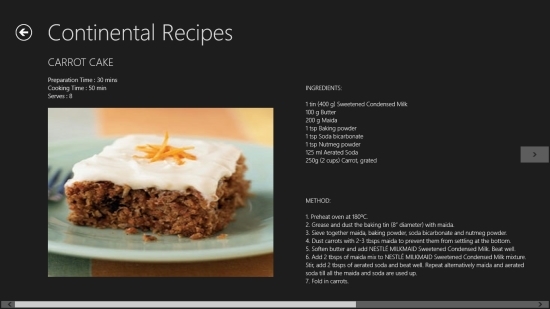 Recipe Palette is freely available in Food & Dining category of Windows Store. You can view the app directly in Windows Store using the link given below at the end. Let’s see how you can learn multi-cuisine food recipes from this app. Recipe Palette is a handy app with a simple but well-designed interface. As obvious, the pictures of dishes look extremely tempting. The related text is also very neatly organised making it convenient to read. As you launch the app, you will land on the app’s Start screen displaying categories of various cuisines with picture tiles of the related dishes. Click on a category to open and view dishes under that category. A list will be displayed stating names of the dishes and their pictures. Click on a dish to open and read its recipe. The next screen will display a tempting picture of the dish, ingredients list, and detailed method of its preparation. You can use left and right headed arrows to flip through all other recipes given in a category. Use back arrow button displayed on the top left of the screen to go back to the main menu. Similar apps: Treats, Cold Drinks Recipes, Italian Gems. Recipe Palette is indeed a good app that brings together popular and hand-picked recipes of different places at one place. Get this app now and try these interesting recipes. Share your feedback via comments.